What started out as a simple drabble to record thoughts, a vision and an idea has turned into a sensation within the Emirati online community and Twitter. The Untitled Chapters Team is honoured to interview Shahd Thani, who may not be a published author yet but her talent of writing and use of word has spun quite the reception among many people who are now following her current story titled A Emirati Kinda Love Story, which tells the story of multiple Emirati Characters within its different chapters. Shahd uploads a new chapter every Friday and like many people, we anticipate it every week because we are huge fans of it. 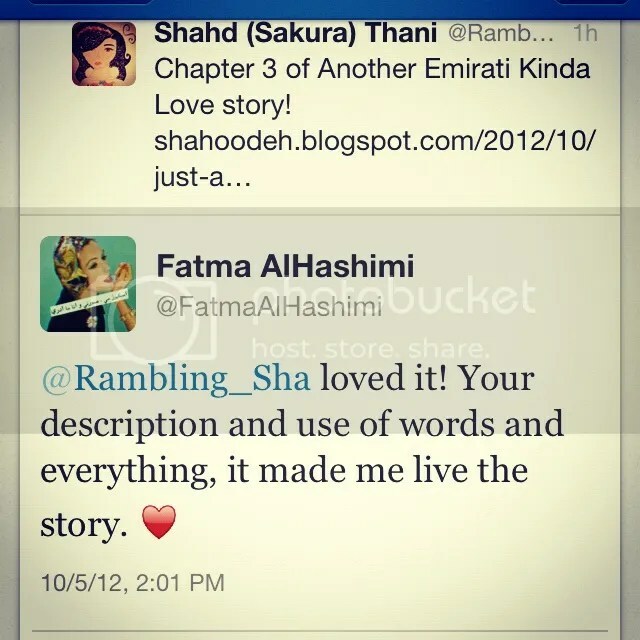 We wanted to interview Shahd to find out more about both the author and the Emirati Kinda Love Story. Shahd is a daughter, sister, friend, and rambler. She likes loud colors and yearns for rain clouds. She loves glossy magazines, make up, but above all books. Her heart is in Japan and a chunk of it is in Bangkok. She also gets a little weirded out when talking about herself in the third person. I have a Bachelor degree in English Literature and Translation from University of Sharjah. I value the translation especially when I’m translating Arabic phrases and idioms into English for stories. English Literature will always be my first love. It echoes in my soul. Q2: How did this idea originate? Where did you get the idea for it? I often write opening scenes to chapters. I write a scene, set the tone, and it just stays in my archive. I usually have an idea that I need to preserve. I was in Saporro at the time. I had walked the same path Sultan and his friends took. In the back of my mind, I could just picture a group of Emirati guys with a travel routine. I had passed by a jewellery stand and the rest is history. I remember having lunch in an Italian restaurant (Nobody does Italian like the Japanese) I was scribbling frantically in my notebook and listening to my sisters’ laughter and jokes. It occurred to me that these were the Emirati stories I wanted to read about. I wanted to read about people with siblings and cousins like mine. I wanted to read about people who love travel and exploring new countries. I wanted to explore relationships, friendships, and conflicts. Q3: Did you ever imagine that this will get the attention it’s getting at the moment? What are some of the comments you’re getting from your readers? There are moments I feel like I’m in a dream within a dream. I don’t think I ever imagined in my most far-fetched fantasies that I would receive this kind of reception. I was braced for all sorts of reactions, but I never expected to be so completely welcomed. Every day I’m humbled by everyone’s kindness. My readers are utterly charming mashallah and I’m utterly blessed by their presence. I have a reader who likes to count down the days and remind me it’s Friday. 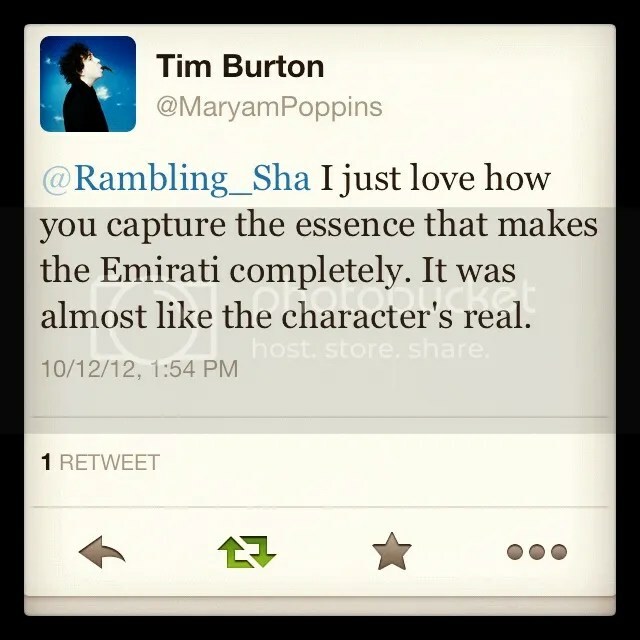 “I just love how you capture the essence that makes the Emirati complete. It was almost like the characters are real” I’ve found readers taking an interest in secondary characters and asking more about them. “Essence of Emirati love” “It blocked me away from all the surroundings.” “Your words made me live the story” I keep every comment I get. I Instagram my favorite and most interesting comments. I have been tweeted lyrics to a Taylor Swift song because it reminded the reader of Buthaina’s feelings. My ultimate favorite comment has got to be “Our writer” It’s the one thing that can move me to tears and humble me. Q4: why did you choose to post your story on your blog? Post each chapter per week rather than write the whole thing and get it published? I have always come across book blogs and been fascinated by the topics the writers choose to explore. I never thought I would take the risk with something I wrote. I recently read that Charles Dickens used to publish chapters of his novels on a weekly or monthly basis. This allowed him to study reactions and modify his stories accordingly. I liked the idea of just putting my story out there even if it never gets published. It will always be a journey, an experience, and I’ve come to know a lot of interesting people mashallah through it. They also get to know who I am as a writer. It is a learning experience. Q5: You’re telling the story of multiple people and their relationships rather than having a single relationship or character as the focus. Why did you choose to do that? In a collectivist society, the first thing you learn is that your choices affect everyone in the family. A story with underlying moral value can cause ripples. In the story the relationships break down to attraction between two cousins, traditional marriage and a Sultan’s choices in love affect the more religious Salem because he is missing that aspect in his marriage. Mayed is held back from his tentative attraction to Hana because his father wants him to marry his other cousin. Buthaina is pressured by her family towards a potential suitor. I wrote it that way so that one character’s joy could highlight another’s pain. There needed to be contrast between moods and feelings. I get to show jealousy, pain, envy, hope, and desperation. Q6: You’re also writing in multiple POV (Points of views), each chapter specifically dedicated to one character. Why did you choose to take up this particular style in your story? This year I have fallen head over heels over the Game of Throne series by George R.R Martin. I admired the multiple POV style he used in his books. I was also very influenced by Julia Quinn’s Bridgerton series. I got the first book of the series for my birthday. I have found it an amazing way to get into character’s heads. It’s impossible not to be sympathetic to a character when you see through their eyes and hear their fears and worries. I also chose it because with a big cast of characters it’s easy to neglect some characters and focus on the main ones. I needed to be able to focus on every single character simultaneously and it seemed the best way to do it as well as layer the plot as I go along. Q7: (Follow up on pervious question) is it much different from the other styles that you’ve written in before? How so? It is a lot lighter than anything I’ve written before but in a lot of ways more complex. There are so many aspects I juggle and have to keep track off. Q8: do you find any challenges in writing this story? Because to us as readers, it flows very easily and naturally so let us know what’s the writing progress like? I write outlines of upcoming outlines. I also write out the character’s backstories with different playlists to capture moods and feelings. I write a draft then show it to a group of my closest friends and fellow writers. I get the initial feedback on what to work on and where I went wrong. I go back and write. It really does take a village when you write, though it is a solitary activity. I’m lucky enough to have close friends to call Beta readers. Because when I’m absorbed with writing, it can be hard to separate the image in my thoughts from the words on the page. You tend to need someone to tell you when your character is coming across as a mean girl when it’s not the impression you want to give. This is crucial because I only have a week to edit and polish a chapter. It’s not enough for me to completely distance myself when I edit which is why Beta Readers are lifesavers. Once I put out a chapter, it becomes set in stone. I can’t go back and edit it in any way. The other challenge is striking the right balance between being realistic and romantic. I’m trying to keep it conservative but playful at the same time. My favorite character changes from one chapter to another. For now, my favorite character is Khowla from Chapter 8. Q10: where do you see this story heading? Q11: we’ve heard about several stories about novels being on blogs which end up getting a publishing deal? Is that part of the dream? Getting published is the ultimate dream. If it happens, it would be amazing. For now, I’m just happy and grateful people are connecting with the characters in my story. Q12: Where do you see yourself in 5 years as a writer? In 5 years, who truly knows? Maybe Emirati Kinda Love story will end up being a trilogy. I see myself writing something more serious like literary fiction or Literature inshallah. Q13: What advice would you give to others who are trying to write or just started writing? For someone who is trying to write, I would advise them to read. Read the classics. Read different genres. Don’t stick to reading one particular thing because you end up being limited. You need different styles of writing to shake you up. There are also a lot of books out there that teach you about writing practice, especially books by Natalie Goldberg. Join Untitled Chapters and find a good writing community to support you. Writing feels less lonely if you just have someone to talk to about it. Mostly pour out all the anxiety, hopes, and wildest imaginings on the page. Save every draft, every scrap, because someday you come back to it with an older view and it can become something amazing.